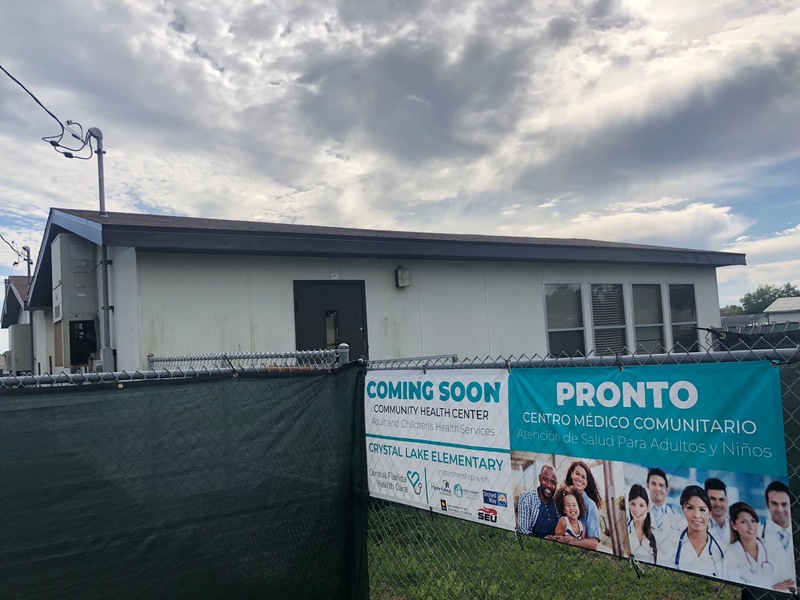 Construction is officially underway on the health clinic at Polk County Public Schools’ first community partnership school — a pilot program that will bring a variety of services to the campus of Crystal Lake Elementary. The work is expected to be complete later this spring. “The work to begin construction on the two portables currently on the school campus is significant for our students, their families, and the surrounding Crystal Lake community, as it signifies that a full-service health clinic will soon be available in a community that currently does not have one,” said Andrea Hagan, community school director. The health clinic will be housed in two portables, each measuring approximately 675 square feet. In late February, crews started the process of renovating the spaces to create exam rooms, a nurses’ station, vaccination room, offices and ADA-compliant restrooms. The construction will also create an entrance and waiting room dedicated to students and school staff members, and another entrance and waiting room for members of the community. Central Florida Health Care, a Federally Qualified Health Center with 12 clinics in Polk, Highlands and Hardee counties, will begin providing medical and dental services once the renovations are complete. “We will also be partnering to provide behavioral health,” said Ann Claussen, chief executive officer of Central Florida Health Care. In addition to the school district and Central Florida Health Care, other partners involved in the community partnership school project include Heartland for Children, Southeastern University and United Way of Central Florida. Polk Vision has also been instrumental in facilitating the project and works closely with the core partners in aligning resources to support the students, families and residents of the Crystal Lake community. Modeled after similar programs in Hillsborough and Orange counties, PCPS’ community partnership school will serve as a hub for education, healthcare and social services not only for students and their parents, but also members of the surrounding community. Crystal Lake Elementary was selected to host the first community partnership school program in Polk County based on factors including existing community partnerships, the physical space to create a health clinic and to sustain future growth, and the public’s ability to access services at the site. Hagan said community partnership schools aim to lift the quality of life within an entire community, thereby supporting students’ academic success. The health clinic is an important step forward in that direction. “The immediate short-term outcomes for our students will be a reduction in healthcare gaps, and an increase in attendance and academic performance,” Hagan said.